It turns out that Vincent Doonan's origin is surprisingly complex, with ties to many different facets of the Marvel universe. This includes the pre-villainous days of the Tinkerer, alternate-future Squirrel Girl from Unbeatable Squirrel Girl #5, and even a background cameo from what looks to be the '92-era X-Men. True, they don't have too terribly large of a role in the plot, but it's interesting to flesh out the universe at the time. Not every villain necessarily needs an origin. Sometimes it's better to have them remain shrouded in mystery, in the case of the Mad Thinker. Other times, it's important to show the origin as an explanation for the character's actions and motivations. In this case, Victor Doonan was a former robot of Doom's who managed to escape during a squabble with Future-Squirrel Girl. Phineas Mason, otherwise known as the Tinkerer, took him in and helped him make a waterproof skin 'face.' In return, Vincent loyally helped him in his electronics store, leaving when he decided to embark on his quest to make the Marvel universe normal again. All of this is told to Gwenpool while she pays only the barest amount of attention. That can't be right, my collaboration with Aranwe isn't until February. Unluckily for Gwen, her plan doesn't work because she called Miles' home number and he isn't at home. Plus, there's that little matter of him thinking that she's a dangerous criminal. With her luck, he might try to call in the Champions to detain her. Thankfully, thanks to the luck of the power of narrative and a little bit of a distraction, she and Cecil manage to escape. Also, thanks to the power of luck, she discovers that M.O.D.O.K. had other agents in his organization. What, you think that any proper megalomaniac overlord worth his robotic salt wouldn't have a large abundance of allies? I don't know about you, but I think that they're all going to die. After all, we don't know any of their names, so they're probably going to die horrible deaths. Hut. hut, empty out the barracks, it's time to form G.W.E.N.P.O.O.L.! Again, I love the little doses of reality. 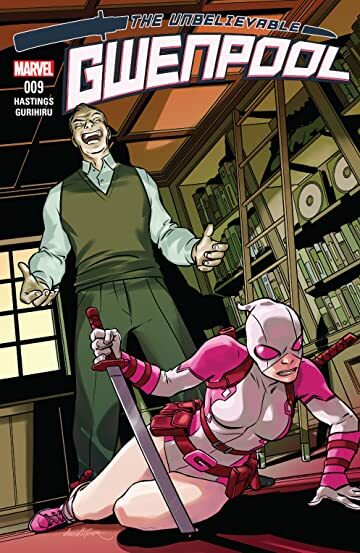 The Unbelievable Gwenpool #9 is written by Christopher Hastings and drawn by Gurihiru. You can find it at your local comic book store.